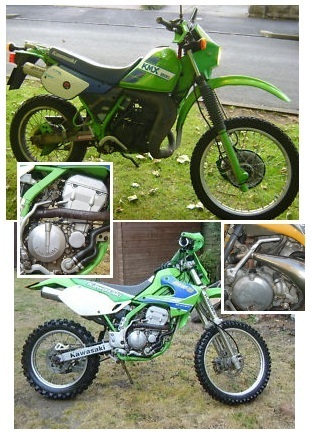 enduro motorcycles - info about enduro motorcycles for sale. Ride with your enduro boots on. Enduro Motorcycles - Everything You Need to Know about them. 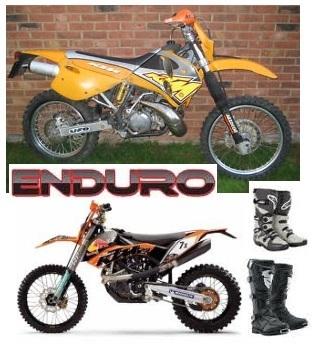 If you haven't decided on which type of motocross model to choose, have you considered enduro motocycles? Here's everything you need to know about these motorcycles. What is an Enduro motorcycle? It short, it's a motocross-like motorcycle that has some features of street motorcycles. For instance, it has the suspension of a motocross motorcycle and features such as a muffler and headlight, which make it functional for street riding. The engine is usually a two-stroke or a four-stroke engine, which is related to the crankshaft's (the main shaft) revolution. The bike's engine size makes it ideal for certain types of races. Larger engines are ideal when you need to climb several inclines. Meanwhile, if you want more maneuverability then a smaller engine would be more appropriate. What are the main manufacturers and models of Enduro motorcycles? How do different Enduro models differ in their design? Who are some of the best Enduro cycle riders of all time? Bill Baird (USA): Baird was inducted into the AMA Motorcycle Hall of Fame in 1999. He is most famous for winning seven U.S. Enduro championships in a row (1960s). He also helped with the founding of the Motorcycle Hall of Fame Museum. In fact, several of the cycles that Baird rode are currently displayed within that museum. Joe Gee (USA): Before the racing of enduro motorcycles began, Gee was one of the best riders for nearly four decades. Interestingly, the racing was known as "Endurance Runs" before it was called Enduro racing. Although Gee had much success in Enduro racing, his greatest achievement occurred in 1951. That's when he won the title of "AMA Endurance National Champion" in 1951. In 1998, the AMA Motorcycle Hall of Fame inducted Gee. Larry Roeseler (USA): Roeseler was inducted into the AMA Motorcycle Hall of Fame in 1999. He was a long-term rider for Kawasaki Team Green. Roeseler has won various motocross races several times, including the SCORE Baja 500 (12 times), SCORE Baja 1000 (10 times), and the International Six Days Enduro (10 times). Although Roeseler retired from motocross racing in 1994, he has continued to participate in various motocross events. How can I choose the best model among enduro motorcycles?